Budding astronomers have been asked to nominate their favourite star gazing locations on the Isle of Man as part of a tourism drive. Last October seven island sites were granted dark sky status by an international body which recognises the best locations around the world. The government now wants to build on that number with a view to attracting astronomers from all over the planet. 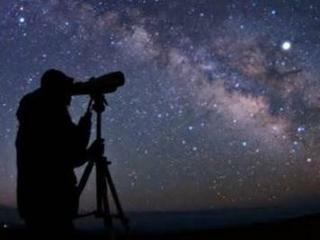 The Milky Way must be clearly visible to qualify as a dark sky site. The chairman of the Isle of Man Astronomical Society, Howard Parkin said: "Sites must be clear of light pollution, provide good sightlines of the sky and have good public access.". "All sites must have the approval of the relevant landowner," he added. Mr Parkin is working with the government on the plan and believes the island could have dozens of suitable locations. The island's seven sites mean it already has the largest concentration of dark sky sites in Britain. The areas already recognised by the Dark Sky Association include Smeale Nature Reserve, Niarbyl and The Sound. Other areas that have been awarded the status are Port Soderick Brooghs, Axnfell Plantation Fort Island and Sulby Reservoir Car Park. The classification is given to promote astronomy and energy efficiency. A tourism spokesman said the development of specialist niche markets to attract high-spending visitors is a cornerstone of their current strategy. According to government figures visitor spending increased by more than 5% in 2012 to £103m, with spending by leisure visitors up by 14% to £47.7m. Mr Parkin added: "The beauty of the island is that it has very little light pollution. There are no motorways or large built up areas, so as a consequence you only have to drive a little way to find a dark sky site and enjoy the splendour of the night sky. "We are the only place which has seven locations in one area. The Isles Scilly have got five nominated sites but we already have seven approved and to be quite honest we could have 27. We have some of the clearest skies in Europe." For the project to go ahead at least 15 more sites will need to obtain the status from the Royal Observatory in Edinburgh. People have until 31 July to submit their suggestions.